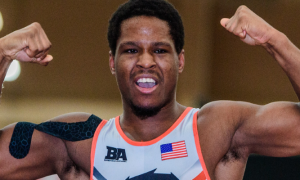 2018 World Team member G’Angelo Hancock (Sunkist) began Day 1 of the Wladyslaw Pytlasinski Cup with the goal of getting some live matches in against legitimate competition ahead of this, the final six-week homestretch before the World Championships next month in Budapest. The level of opposition available, as expected, was significantly high. With that, the objective changed. Hancock, 21, went from hoping he’d grab enough match time to make participation worthwhile to defeating the one man everyone tends to point towards this time of the year. In the 97-kilogram semifinal, Hancock faced off with 2016 Olympic/three-time World Champion Artur Aleksanyan (ARM, world no. 5) and delivered one of the biggest victories for a US Greco athlete throughout the current quadrennial. 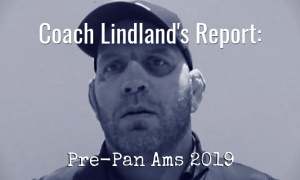 But that is not what is so surprising — Hancock put forth a strong effort against Aleksanyan prior to falling via tech last year at the Paris World Championships. Instead, it was the method of victory. On Friday, Hancock got Aleksanyan out of there, and quickly. Right from the whistle, Hancock engaged with Aleksanyan and locked around for his signature bodylock. As soon as his grip was secure he went for it, pulling Aleksanyan over and straight to his back. Hancock adjusted his position on top — and that was that — with the pin being recorded at just :28 into the first period. Hancock advanced to the semifinals following victories over two other stout opponents. 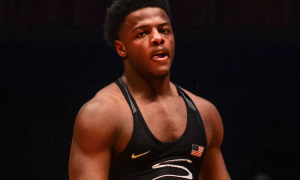 In his first match on Friday, Hancock was given a solid test in the form of 2015 Junior World Champion Nikoloz Kakhelashvili (ITA), who previously competed for Georgia. The quarterfinal went smoother. Operating against Russia’s Maksim Safaryan, Hancock went on a scoring blitz that resulted in a 9-0 tech fall. There is still one match to go for Hancock as he now finds himself in the 2018 Wladyslaw Pytlasinski Memorial final versus 2016 Rio Olympian Nikolai Bayryakov (BUL). Earlier this morning, Bayryakov defeated Turkey’s Suleyman Erbay, who US fans may remember benefitted from a missed leg foul to squeak past Hancock at the 2017 Junior Worlds. Aleksanyan is the second Rio medalist to be vanquished by the US athlete. At the World Wrestling Clubs Cup in December of 2016, Hancock also decisioned Olympic bronze Cenk Ildem (TUR). Two other US Greco athletes will be taking to the tarp before Hancock meets Bayryakov in the gold-medal match. 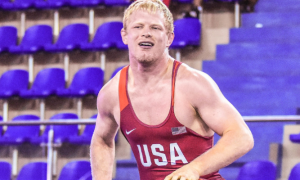 Brandon Mueller (77 kg, Air Force/WCAP), who arrived in Poland on Wednesday evening, will be battling it out with Oleksander Kukhta (UKR), and two-time Trials winner Joe Rau (87 kg, Chicago RTC) goes up against 2013 Military World gold Oleksander Shyshman (UKR). This is another familiar face: Shyshman defeated Ben Provisor (NYAC/NLWC) in the qualification round of the 2017 World Championships. 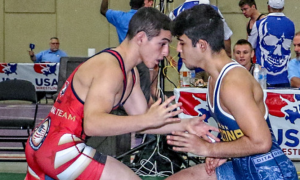 Wrestling resumes tomorrow morning at 10:00 am local time (4:00 am EST) and streams live on Trackwrestling. 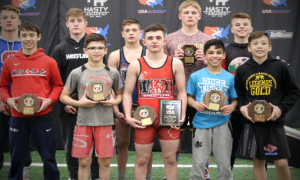 Correction: An earlier version of this article indicated that tomorrow’s Pytlasinski Memorial would be aired on United World Wrestling’s portal for the tournament, as it did on Friday. 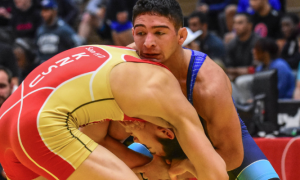 Trackwrestling has since adopted the broadcast for the US audience.